More than 3,000 people joined the Jesuits in Vietnam for the close of a yearlong celebration of the arrival of the first Jesuits in the country 400 years ago. 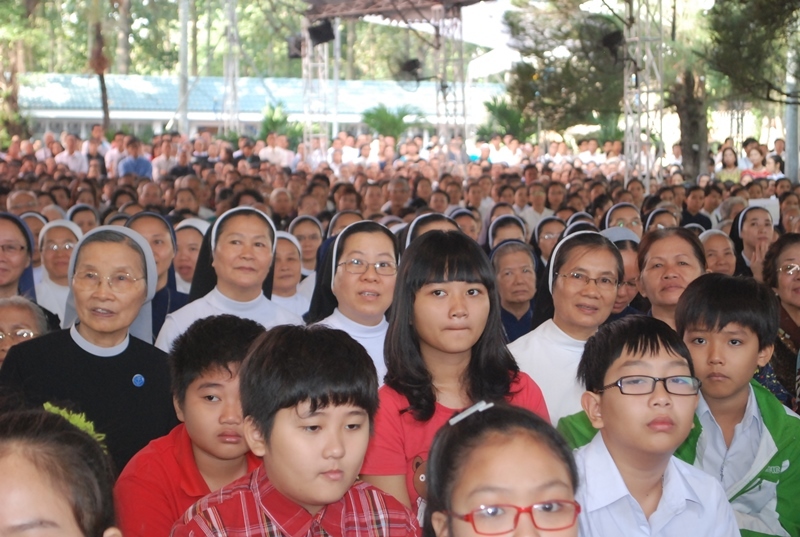 The mass was held at the main Jesuit compound in Thu Duc, a suburb of Ho Chi Minh City. Jesuit Bishop Cosmas Hoang van Dat of the Diocese of Bac Ninh presided, and 15 bishops from other dioceses concelebrated. Also concelebrating were Fr Adolfo Nicolás SJ, Superior General of the Society of Jesus; Fr Daniel Huang SJ, Regional Assistant to Fr General for Asia Pacific; Fr Antoine Kerhuel SJ Regional Assistant to Fr General for Western Europe; Fr Mark Raper SJ, President of the Jesuit Conference of Asia Pacific; Fr John Dardis SJ, President of the Conference of European Provincials; and Major Superiors from the Jesuit Conference of Asia Pacific. Numerous priests and religious men and women also attended. In his homily, Bishop Cosmas recalled the question “Quid agendum?” or “What to do?” – a phrase St Ignatius de Loyola had asked God while discerning his mission. “Nearly 20 years [after St Ignatius’ discernment], the Society of Jesus was formally approved by the Holy See,” he said. Bishop Cosmas said it was this same question that led to laying the foundation of the Church in Vietnam. After their expulsion from Japan on January 18, 1615, Jesuit missionaries arrived at Hoi An, where they served Japanese Catholics living in the area, and introduced Christianity to the local people. “Many problems were considered such as language, customs, and politics. It is sure that they asked themselves ‘Quid agendum?’” said Bishop Cosmas. The Jesuit mission in Vietnam ceased with the worldwide suppression of the Society of Jesus in 1773, but the Jesuits returned in 1957 at the invitation of the South Vietnamese government to help develop universities and the request of the local bishops to train local clergy. They started the Pontifical Institute of St Pius X in Dalat, which had a great influence on the Church in Vietnam that is still evident today. Many Vietnamese bishops attended the institute including Cardinal Pierre Nguyen Van Nhon, one of the new cardinals named by Pope Francis on January 4. In a letter to the Jesuit Vietnam Province the new cardinal expressed his gratitude to the Society of Jesus. “As children of the Vietnamese Church, how can we not keep in our hearts gratitude to the Jesuit missionaries who enthusiastically sowed the seed of the Gospel and worked lead to the Romanization of the Vietnamese script, called ‘Quoc Ngu,’ for the Vietnamese people?” he asked. During the Jubilee year, the Jesuits led seminars, retreats and pilgrimages to places that were once significant Jesuit centres in the 17th and 18th centuries and held celebratory masses in parishes across Vietnam. 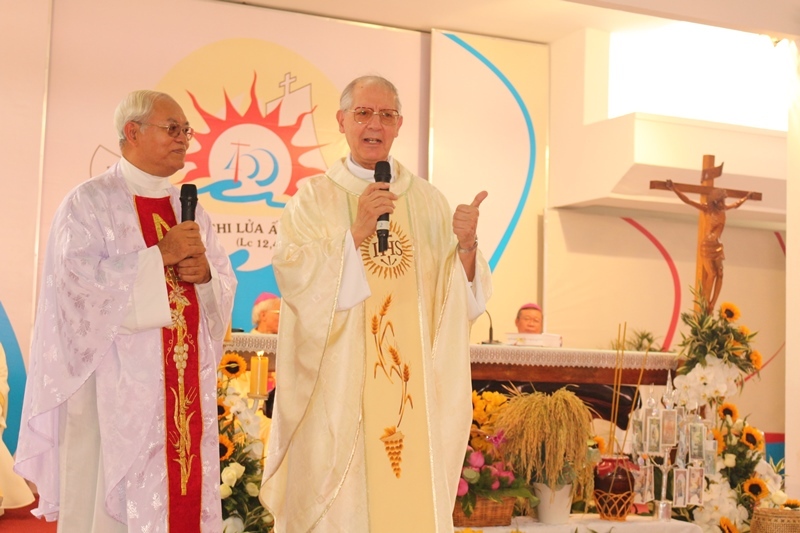 The Jesuit Vietnam Province is one of the fastest growing provinces in the Jesuit Conference of Asia Pacific with 212 members including, a bishop, 55 priests, 96 scholastics, 18 brothers and 42 novices.